On Arrival, you will have a private transfer to your overnight hotel. You can have an optional relaxing moment at the spa enjoying a treat of your choice. You will have dinner and rest. Day 02: Lake Bogoria Hot Springs Excursion. On this day you will depart Nairobi after breakfast for L. Bogoria. Arrive Bogoria spa resort in time for lunch, shortly after, depart for L. Bogoria geysers and hot springs. Connect with nature in the quietest natural environment. Enjoy the birdlife, you can carry a camera to take pictures of the unique birdlife in this area. The lake has algae which attracts seasonal flamingoes. Return to your overnight lodge for dinner and rest. The pool at Bogoria Spa resort is a naturally heated pool from the surrounding geothermal action. It is therapeutic to the skin. Lake Bogoria is a small equatorial Lake that has geysers and hot springs. Along the Lake on the western shore is a bed of hot springs and blowholes, which infrequently erupt 2.5 to 3 meters (8 to 10ft) into the air, and constantly emit a pungent sulfur smell. This geothermal phenomenon is intriguing but also dangerously hot. The Lake is also home to many animals and flamingoes. On this Day after Breakfast you will find out for yourself the purpose for this trip. You will have a guided walk in the neighboring community as Judy, a local Lady working in L. Bogoria spa resort takes you around the villages and tells you what a typical Bogoria girl goes through in her vulnerable young age. This walk will make you understand the loop holes in the Bogoria community. What need to be done and where we can come in as a team of women who have taken this trip. You will have bush lunch, hot if possible and latter proceed to a local girl school where you will have a meeting with the girls encourage them and empower them that there is more to a lady’s life than Birth, Initiation which in their case is Female Genital Mutilation (FGM) and Marriage. You will further talk to the girls in a Local Girls’ Boarding school about Female Genital Mutilation. Why they should raise more resistance against it. In this picture is a Bogoria girl who the community has crowed fit for marriage, she’s barely 16 years but in Lake Bogoria and many African rural communities nobody cares about the age of a girl. 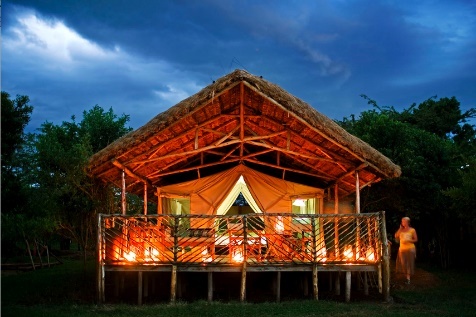 Meals and Overnight: Lake Bogoria Resort and Spa or Similar (FB). After breakfast depart leisurely for Lake Elementaita shores. You will drive on the floor of Rift Valley and arrive at L. Elementaita in time for Lunch. After lunch you will have an afternoon at leisure. You may opt to walk along Lake Elementaita shores or pamper yourself at the Lodge Spa. Lake Elementaita shore is a beautiful and quiet place very conducive for yoga, there for, you might want to carry along your yoga mat. After breakfast, you will leave Nairobi for Mara North Conservancy through the floor of the Rift Valley to arrive at Mara North Conservancy in time for lunch. You will then have an afternoon game drive in the conservancy from 1600hrs for a chance to see Lions in large prides, Elephants, buffalos, zebras and other numerous plain animals. You shall return to the camp at sunset. Day 7: Maasai Mara National Reserve. You will have a full day in the Mara National Reserve with an option of doing an early morning game drive at 0630hrs before breakfast and an afternoon game drive at 1600hrs or depart for a full day game viewing with picnic lunch that will take you to the Mara River to see the hippos and the crocodiles. You can also opt to take a balloon safari which will be followed by a champagne breakfast in the bush (extra cost). An optional visit to a Maasai Boma (homestead) will reveal their outstanding culture and customs (extra cost). Balloon Safari: Depending on where you are staying, you will be picked up very early in the morning and transferred by a 4×4 jeep to the launching site at 0500hrs. Here you will meet your pilot, receive a briefing and watch the inflation of your balloon. It’s a dawn take off, rising as the sun rises and floats in whichever direction the winds of the morning take you. Your pilot can precisely control the altitude of your balloon: sometimes flying at treetop height, sometimes lower, offering a unique perspective and great photographic opportunities of the wildlife below. At other times he will ascend to 1000ft or more to see the enormity and wonderful panorama of the Maasai Mara. From time to time the pilot must put more heat into the balloon with the powerful whisper burners. In between these burns, there is silence apart from the natural sounds below. Upon landing, you can observe the complete deflation of the balloon envelope and be ready for a full bush breakfast. Out of Africa Breakfast: Imagine sitting at a table under the shade of a classic umbrella tree on the Maasai Mara Plains. The table is laid with bone china and king’s silver cutlery. Day 08: Mara North Conservancy. You will have an early morning game drive and a late afternoon game drive with time spent at leisure in between the game drives. Mara North Conservancy is a beautiful private wilderness area of more than 30000 hectares, bordering the Maasai Mara National Reserve in the south of Kenya. It is rich with wildlife and includes sites such as the world famous “Leopard Gorge.” This land formerly belonged to two Group Ranches and was subdivided into individual, private titles in 2002. You will have an early morning game drive returning to the lodge for breakfast. After breakfast, you will check out and have a leisurely drive to Nairobi arriving in time for lunch. Later, you will be dropped off at the airport in good time for your flight back home as per your flight schedule. Empower a single mother by giving them hope for tomorrow through sustainable farming. Give that school girl reason to smile by proving an year supply of sanitary pads. Give your skin a life time therapy in a natural heated swiming pool. Come and empower a woman and a a girl in Africa. Give back to the society by giving hope to a girl in Kenya. Donate sanitary pads to a needy kid in Kenya. Empower a young woman by giving her hope for tomorrow. Be a part to stopping early marriages in Africa Kenya.